MySQL driver introduced again. Thanks to Martin Ellis. KexiSQL (file driver) migrated to SQLite 3.0.7, former libkexisql is now libkexisql2 for compatibility (it's updated to 2.8.15, by the way). Sqlite file version is now autodetected on startup. Sqlite2 to sqlite3 format autoconversion added (with progress dialog). Every table view now uses sorting action available also from toolbar and menu. Tab, BackTab keys work again; skipping to next/previous row added; Left, Right arrow keys now by default behave like BackTab, and Tab. Hidden columns are internally supported; useful for query data views. On table creation (or altering), if there is no primary key, user is asked if it should be added (automatically). Renewed SQL Parser reused for SQL view (debugger). Many new actions (all undoable of course): "Snap to grid" or not, many align functions (to right, to top, to fit) and size functions (to fit, to biggest, etc. 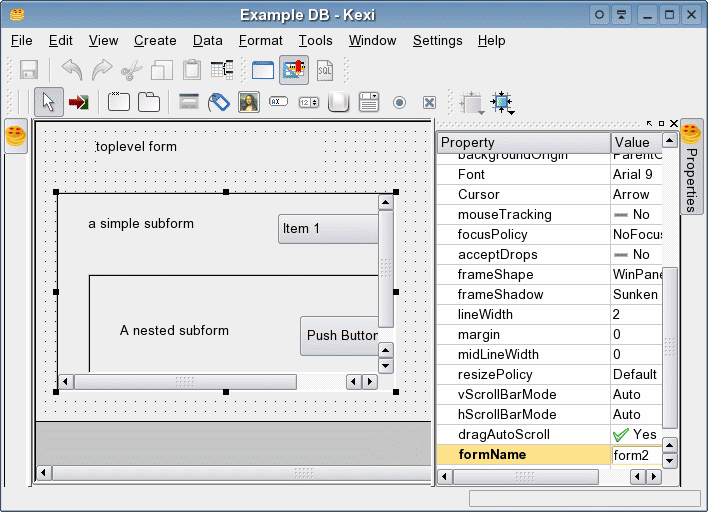 ), "Raise" and "Lower", "Break layout", "Select All, "Clear contents"
Kexi now supports subforms as MS Access! These are forms embedded inside other forms. Saving and loading works, and subforms can be nested (many levels: better than in MS Access). Many error messages and warnings added. Kexi has now over 750 messages available for translation. Objects renaming. Operates within transaction. Warning messages are used instead of questions for dangerous messages.